Once again our friends at the Brisbane Tolkien Fellowship are hosting their annual “Evening in Middle-earth”. This year their Guest of Honour is none other than dwarvish prankster, Nori, the wonderful Jed Brophy! 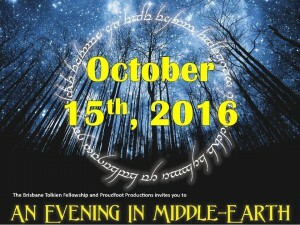 So if you’re from Brisbane or planning on visiting Queensland this month, why not head along to An Evening in Middle-earth on October 15. Actor Jed Brophy is the guest of honour at An Evening in Middle-earth, October 15th. Brisbane Tolkien Fellowship is proud to announce that Jed Brophy, who played Nori the Dwarf in all three Hobbit Movies, is the special guest for our annual An Evening in Middle-earth, a wonderful entertaining night with dinner. All proceeds of the night support The Pyjama Foundation. NZ, Rover Tours Wellington, Photo packages, Dinner for two and many more. Two course Buffet Dinner; roasts, vegetables, fish, Lasagne and deserts. Smaug Dragon Cake and hoard of treasure. Themed Tables representing the various races of Middle-earth. The best Middle-earth night.. all for $50. More details click here.